Lee Glover was axed by Peterborough United to make way for a more experienced assistant manager to help first-season, first-team boss Grant McCann. Glover (46) was sacked yesterday (March 18) with just seven matches of a frustrating League One campaign to go. There are no plans to replace him before the end of the season. Barry Fry (left) and Darragh MacAnthony. Posh director of football Barry Fry delivered the news to a ‘baffled’ Glover at the behest of chairman Darragh MacAnthony. Fry hinted at Glover’s perceived ‘negative’ approach putting him at odds with the chairman’s preference for exciting football. Fry also revealed Posh had offered the assistant manager’s job to former club coaches Kevin Russell and Mark Robson before they appointed Glover last summer. Glover leaves with Posh stranded in mid-table after picking up just 15 League One points from a possible 48 in 2017. Fry said: “The chairman had been thinking about a change for a while. He’s not been happy with the way the team has been playing or with the results. “He backed Grant’s decision to hire Lee last summer, after we had spoken to Mark Robson and Kevin Russell, but he honestly believes he is now doing Grant a favour by letting Lee go. “Grant would have worked happily with Mark Robson or Kevin Russell, but Mark took a job with England instead, while Kevin had too many family commitments to make the move back. “The chairman feels we need a more experienced number two. He looked at the managerial set-up and it was four relatively inexperienced men in Grant, Lee, Mark Tyler and David Farrell. “Lee also made it clear he liked to win a game 1-0 which is not what the chairman wanted to hear. He wants to excite the fans with high-scoring wins. The chairman beats himself up about delivering success and this decision is designed to help that. “We won’t be appointing another assistant until the summer. Grant has decided to work on his own for the final six weeks and then we can give it some serious thought at the end of the season. The Peterborough Telegraph spoke to Glover earlier today (March 21). He admitted he was baffled by the decision, arriving as it did so close to the end of the season and with the club unlikely to get involved in a promotion or relegation battle. Speaking before Fry made his own statement, Glover said: “All I was told was that people above Grant wanted to make a change. There were no specific reasons given. “I was on the same page as Grant as far as style of play was concerned. I did say once that I’d rather win a game 1-0 than lose a game 4-3, but that’s not being negative. Glover is on gardening leave for six months, but wants to return to football as soon as possible. 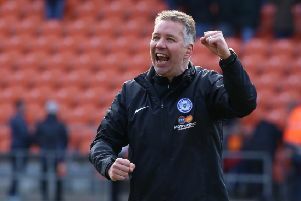 Russell was assistant to Darren Ferguson when the club achieved back-to-back promotions at the start of MacAnthony’s rule at Posh. Robson was appointed assistant manager to Gary Johnson in 2010.